opportunity to experience something different than what we believed was the only truth. We ask and answer the four questions. ​Then, we turn the thought around exploring examples that could be as true or even truer. Examples: In my imagination (not reality), I see them in worst case scenarios. I put them in that hopelessness. I'm wasting time in my fears which stops me from enhancing time and expressing love. It stops me from inspiration to find ways to be love and peace, and ways to help in ways that are helpful, so I miss opportunities to contribute to life and love in their life, and my own. Examples: I can spend a lot of time in fear and then paralysis. I can isolate and get stuck, not joining life in a pro-active way. I'm wasting all the unconditional love that can be found in me and through me. That disconnects me from me, and from my loved ones. This is a great pain to waste my life this way. They're not wasting their life. Examples: I have not been assigned the master of their life and their divine purpose and contribution, whatever that might look like. I believe that all can be used for transformation, not wasted. Someone, somewhere is learning from their life, including me. They are worthy, nothing wasted. Their life matters! to me and no matter how they are living it. My job is to love them wherever they are at in their life, the life I do not own, the path I can not choose or do for them. I can love them, as is, now! They are not wasted there, and neither am I! Connected! It’s helpful to notice our answers with compassion and to seek truth for understanding, not blame or criticism. You know the saying the truth sets you free? It sure can! 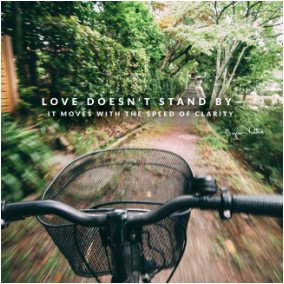 In the process of doing The Work, confusion can turn to clarity and understanding. Where there is understanding, there can be peace. The Work is not therapy, it’s not to condone harmful actions, and it’s not to deny or change the thought. It's about self-realization. It’s a way to embrace reality and address situations in a more effective way. New information arises from our inner wisdom and our heart. New insights into how to approach life and circumstances in a more proactive way are also effects of doing The Work. It’s a way to move into a kinder way, and out of fear, unmet expectations, misplaced assumptions, misunderstandings, depression, anxiety, blame, and more. 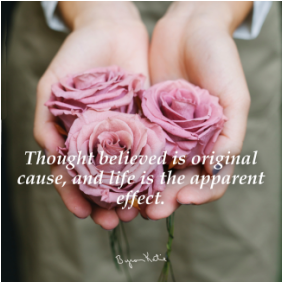 Doing The Work reveals the cause and effect of what we’re thinking and believing, as well as what can change. The Work provides an opportunity that is profound, complete and powerful because it's such a personal experience. Your answers are your own, and can be felt on various levels: physically, spiritually, mentally and emotionally. I invite you to experience this transformative process. I can say wholeheartedly, I've become someone far more peaceful, capable, and willing to inquire through the confusion. During inquiry, I feel a shift away from the stress of believing my assumptions and stories, and into truths that bring greater understanding and direction. This inevitably and reliably brings a more relaxed state of body and mind. With inquiry, I come out on the other side … from darkness into light, and lighter, one thought at a time. And, you can too. 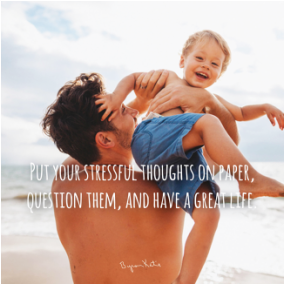 ​ You can believe your thoughts and stressful stories, or question them. How about you? Schedule a Complimentary Introduction Today! ​You’ll find helpful worksheets to do The Work below. Welcome!